My friend Chelsea, of Nailed, put out a call a few days ago because she burned her hand (her swatching hand, even...ouch and double ouch! 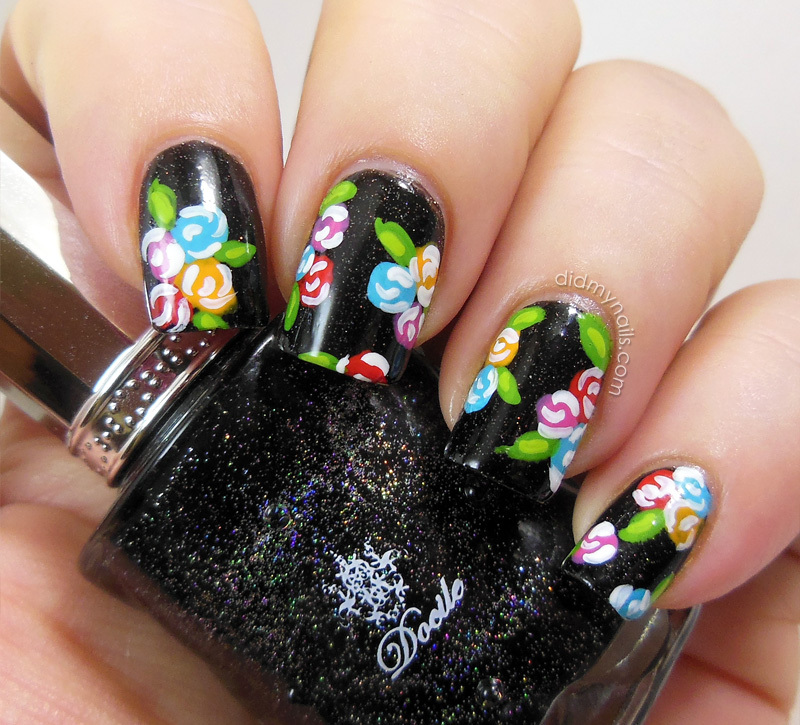 ), so I did some flower nail art with acrylic paint to pitch in while it's on the mend. I think I've mentioned before that Nailed was one of the first nail blogs I started reading, way before I ever thought I'd start one of my own, so it really is an honour to be able to help out. And more than that, Chelsea is such a sweetheart that it's a genuine pleasure, too. Hope that hand is feeling much, much better soon! Rins was really onto something with this combination! Thank you very much!! Love this look, it's really beautiful. These look so pretty Liz! Thank you very much, Maria! I really wasn't wild about the colours I'd chosen at first, but once I added the white and the leaves, it really came together. So grateful to Rins for the inspiration! Aw, thank you very, very much for both!! This looks amazing - love all of your floral manis!